The Social media and the SEO are two different categories of topic in the internet. However for the bloggers and web masters like me, it is not a two. Most of the time, I may concern it as a one for the benefit of me. However , before coming to the proper part I would like to introduce the SEO and the social media in a different categories for the convenience of the readers. In the simple term, social media is a place or platform in the internet that you can use to gather with other people. As an example Facebook is the widely used and well known social media all over the world. 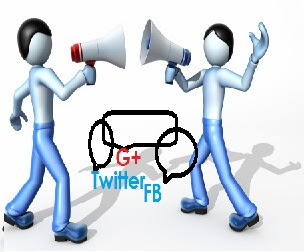 In addition to that we can concern on Twitter, Google +, You Tube and number of social media in the internet. However, I like to stress you about the Blogger which has forgotten to most of the bloggers although they use it widely. SEO or the Search Engine Optimization is the term used for identify the process of activities which will improve your search engine visibility. This is normally done by number of ways and means including link building, search engine submission, advertisements, Meta tags etc. I think the most part of the SEO will done by these things, but it cannot be forgotten that social sharing and the social media will help you to index your page in Google lot. What is the usage of social media in the SEO process? 1. Induce the search engines to index your site fast. 2. Allow you to make a certain group of readers. After the indexing of the site on the Google the next important thing is to have a set of regular uses. There also the social media can play a main role in the creation of the readers. These readers not only read, they come through search engine and share link though their social media sites. This will helps in generating more and more readers for your blog or web sites. 3. Improve your Google PR. We always talks about the page ranking on SEO because the ultimate goal of us in doing SEO is to get good Page Rank and good traffic. In there also, the function of the social media is very important. If you have fan page with high number of fans, you will experience this very well. 4. Allow you to get backlinks in high PR site. Although most people try to build unnecessary and ineffective black hated black links in different ways, it is very difficult to get good and working backlinks from other site. If we talk about Facebook, Google Plus, Twitter and the other social Medias, most of they have page rank above 7-8. Facebook have even 9-10. So getting a blacklink from such site can surely induce your page rank. If you search a certain page in the interenet you can find some results comes through the social media. It means that the social media have helps to index your site in search engines. This will work as a good link on search results to improve your site results. However you find out another number of importances of it. But I am not accepting the social media spamming for generate good page rank and the traffic. It will surely harm you. Therefore try to use it acceptably and appropriately. Social media marketing is a great way to socially promote any business which in turn helps to attract new customers. This method has changed the technique of discovering different products and services which is now connecting the audiences to the business owners. Nowadays, many marketing communications firms, like Vine Communications, is providing an approach to build communication platforms effectively and efficiently.